So here I am, back from Europe instead of on the Navigator of the Seas. I have time on my hands and a real need to keep busy. 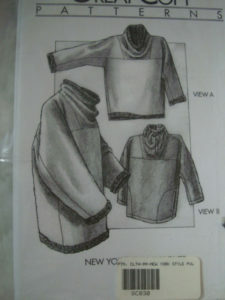 Digging through my pattern stash, I find Great Copy #830 – The New York Style Pullover. Humm – comes in XS to XXL. Ok that about covers the world. And only six pieces (including the pocket). Its all fleece. No lining, no interfacing, nothing fancy. And off I go to JoAnns to find that there is a great sale on Polar Fleece of all kinds. On the spot I decide that just about everyone needs one. Well, the ones with a sense of humor anyway. I find hedgehogs for me, a blue for Shana, the obvious for Maus and Dani picks something quiet for herself. Since this is oversized, I can essentially whip off four the same. Less than $18.00 later (oh, I just love discount coupons and sales I had enough fabric for five tops) and headed back out the door and home to have fun!